"Sensor-Based Reactive Execution of Symbolic Rearrangement Plans by a L" by Vasileios Vasilopoulos, T. Turner Topping et al. 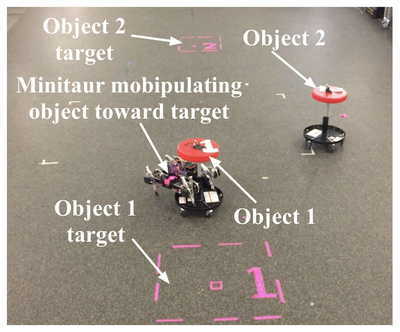 We demonstrate the physical rearrangement of wheeled stools in a moderately cluttered indoor environment by a quadrupedal robot that autonomously achieves a user's desired configuration. The robot's behaviors are planned and executed by a three layer hierarchical architecture consisting of: an offline symbolic task and motion planner; a reactive layer that tracks the reference output of the deliberative layer and avoids unanticipated obstacles sensed online; and a gait layer that realizes the abstract unicycle commands from the reactive module through appropriately coordinated joint level torque feedback loops. This work also extends prior formal results about the reactive layer to a broad class of nonconvex obstacles. Our design is verified both by formal proofs as well as empirical demonstration of various assembly tasks. This work was supported in part by AFRL grant FA865015D1845 (subcontract 669737-1) and in part by ONR grant #N00014-16-1-2817, a Vannevar Bush Fellowship held by the last author, sponsored by the Basic Research Office of the Assistant Secretary of Defense for Research and Engineering.